Eating meat from any four-legged animal was prohibited in Japan until the Meiji Restoration of 1868. However, increased trade with the United States during the 1970s has now caused the country to be one of the main importers of American pork. Over the course of the last ten years, the level of US pork exports has nearly doubled in terms of value, according to the United States Meat Export Federation (USMEF). Now at over five billion pounds by weight per annum, these yearly pork exports have a value of over six billion dollars. It is a significant industry and a very important part in the national economy in contributing to the balance of foreign trade. The production of meat is the largest sector of the US Agriculture industry, and pork is an important part of it. In 2013, 23 billion pounds of pork and pork products, such as ham and bacon, were produced from 112 million hogs in the country. The States leading the way were Iowa, North Carolina, and Minnesota. Exporting pork produce accounted for over 20% of the total volume of the meat trade. Statistics show that the country that imports the greatest volume of America’s pork is Mexico, the US’s geographically closest trading partner to the south. 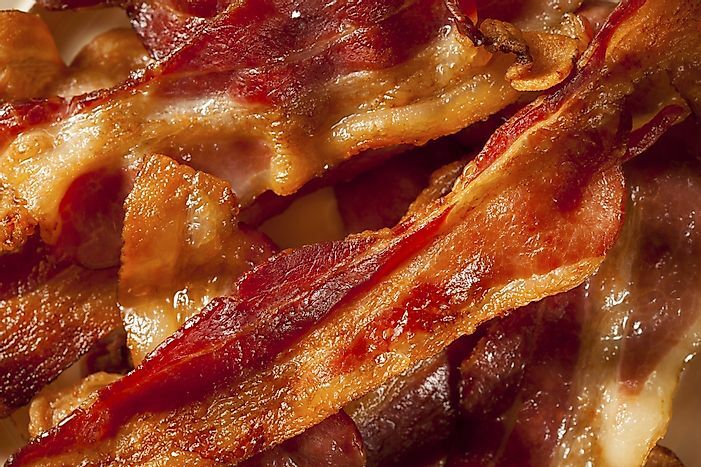 It is noticeable that the volume of the bacon trade with Canada, the other major neighbor of the US, has maintained an appreciable level but has not increased as dramatically as that of Mexico or even Japan, the second largest importer by weight of US pork. Indeed, Mexico and Japan had extremely low involvement as far back as 1990. Mexico’s meteoric rise in pork imports can be directly attributed to the outcomes of the North American Free Trade Agreement (NAFTA) which allows for easier and increased trade between the US, Mexico, and Canada. Whilst trade with Canada has improved, it was already at a decent level by the time the NAFTA treaty was signed in 1989. Therefore, NAFTA’s effects are reflected more greatly in the trade figures between the US and Mexico. It is possibly set to rise further as a result of The United States Department of Agriculture (USDA) reaching an agreement earlier this year that will pave the way for increased meat trade with both Mexico and Peru. Projections suggest that the effect of Peruvians eating exported American ham and bacon alone could bring in millions of additional dollars to the US pork industry in coming years. In terms of monetary value, the largest importer of pork from the United States was Japan, and they are similarly second in US pork import tonnage. Although exporting meat to Japan is relatively a new phenomenon, today the island nation imports over a billion pounds of US pork carcass, approaching Mexico and more than doubling that of Canada. Prior to 1868, eating meat from any four-legged animal was actually prohibited on religious grounds in Japan. Subsequent to that, importing meat was strictly controlled as with most other consumables, and even foreign visitors’ entries into the country was practically impossible due to restrictions. It is only since the 1970’s that exporting meat to Japan has become a burgeoning trade. The USMEF was set up during that decade as a development organization for the US meat industry’s international interests. The USMEF’s first overseas-based office was established in Tokyo in 1977. Exporting to Japan has been a focal point of their work since. It is clearly a good measure of the USMEF’s success that Japan is now the number one importer when measured in financial receipts. Following Japan, Canada and South Korea import similar levels of US pork. Though significant, the remainder of US pork exports are much more thinly dispersed over the rest of the globe. Asian and Latin American markets are especially important, and likely to become even more so as more of their peoples become affluent enough to purchase and consume meat on a more regular basis. Across the industry, the meat producers of the United States have aggregately developed their export markets well and look set to continue to do so. The effects of strong free-trade ties have had a very beneficial effect on the business. The USMEF should also be recognized as integral in such outcomes, as their dynamic development programs, that were initially put in place nearly forty years ago, have had a very supportive effect, showing the value of planning a long term strategy for success in global markets. Ongoing issues for the industry that remain to be resolved in the US are animal rights, sanitation effects on nearby populations, and the environmental impacts of hog farming operations and pork processing.